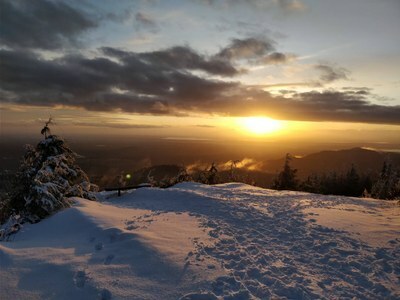 A 5-Peak hike of Tiger (East, Middle, 1, 2, and 3) on snow-covered trails and dirt roads. Trip was 18+ miles and took around 10.5 hours at a moderate pace. Trails were snow-covered starting below 1,000 feet, but we did not encounter ice. At the Hiker Hut on Tiger 1, we donned headlamps, and turned them on when we dipped down back into trail leaving Tiger 2 for Tiger 3. At the summit of Tiger 3, we put on microspikes for the descent via Cable Line. The trail was not icy, but had seen a lot of foot traffic earlier in the day and was covered with hard-packed snow. Route-finding on Tiger, especially on the east side, takes attention. There are many trails, some with junctions a mere 300 feet from another junction, trails that aren’t signed, and new trails and re-routes that are not on the latest Green Trails map. We conferred many times over navigation choices; all the participants were well prepared to participate in this and all did so in a respectful and supportive manner. We did make one navigation error that resulted in 10-15 minutes of backtracking. We parked outside the gate at the Trailhead for Cable Line and walked the road eastwards to start out on the Lingering Trail. We had low to mid 30s, moderate snow until 10:00 and then filtered sun afterwards, along with a beautiful sunset. This trip was a change in destination from an Olympics scramble due to potentially icy roads on the peninsula. Avalanche danger was “red” everywhere else. This was a great alternative for a group hoping for a long-mileage day with some elevation gain, but seeking safe roads and safe terrain. Between the clear roads on I-90 to High Point, the beauty of the sun and snow-draped trees, 18 snowy miles underfoot, 5 summits, and a beautiful sunset, I would say “Mission Accomplished”. Also, I need to mention that we had three rounds of summit treats! Sunset photo taken by Ananth Maniam on Tiger 1.